For me, the challenge has always been how to creatively use these beautiful root veggies without getting overly tired of them before the end of the winter season. 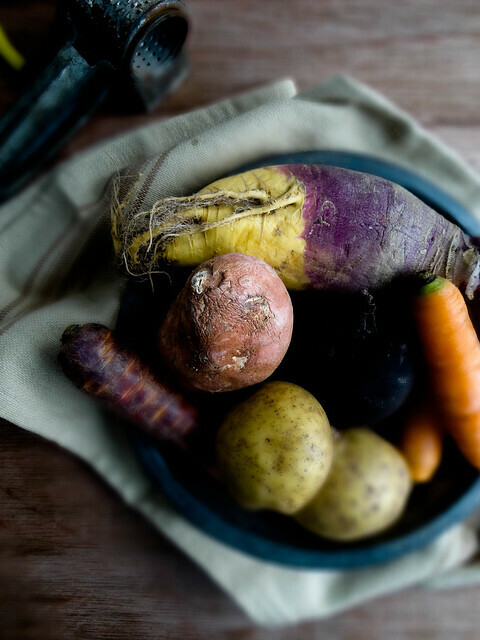 Luckily, root veggies are pretty versatile - mashed, roasted, pureed are just some of the most common methods of preparation. However, once shredded they take on a totally different personality. 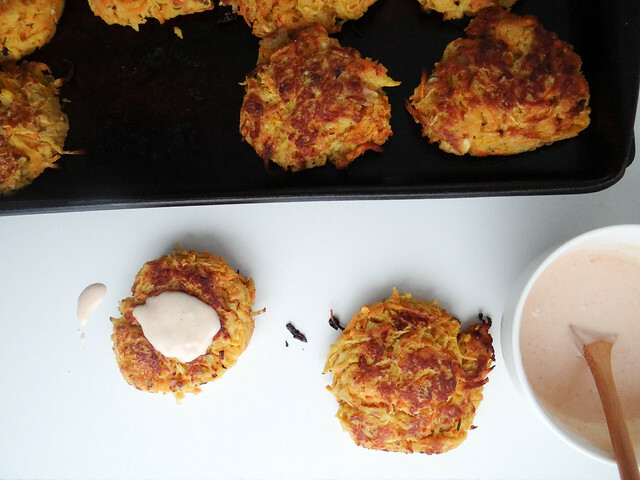 Much like a latkes, these root veggie fritters are fried in a bit of oil, then popped in the oven to finish off. It is hard to see in the picture, but tucked away in the center is a massive black radish. One of the best things about supporting your local farmers is being exposed to new varieties of familiar veggies. I am willing to bet your standard local grocery store isn't stocking black radish- at least mine isn't. Knowing where our food comes from is very important to Justin and I. Being able to have a conversation with the person who grew the food that will grace our table is amazing, I love learning their favorite way of preparing a veggie they grew, the best way to store it and why they decided to grow that particular variety. The relationships I have formed over the years with local growers has been such a wonderful experience- it makes us a better , stronger community. 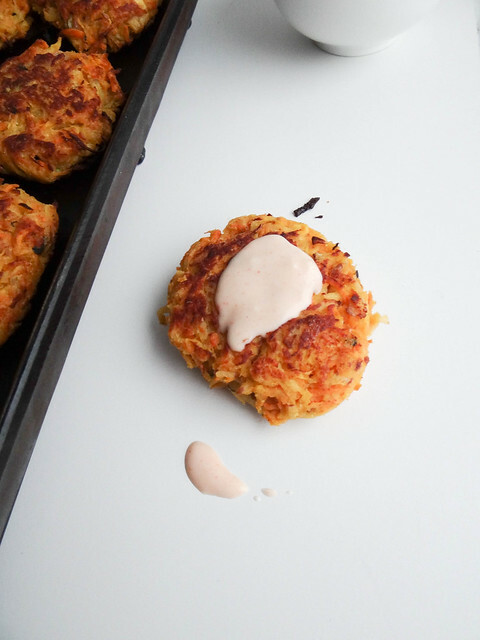 A quick chickpea batter binds the shredded veggies, a little maple syrup is added for a touch of sweetness- this is especially needed if you select spicier root veggies for your fritters; radish, turnips. The maple syrup also helps to bring the natural sweetness out of the carrots and sweet potatoes. A quick and easy spicy aioli tops the fritters, the perfect balance of sweet & spicy - they are also excellent served alongside garlicky winter greens or a warm lentil salad with pita. Is it important to you to know where your food comes from? Is your community actively involved in spreading local eating and supporting area growers? Fit your food processor with the grater attachment- run all scrubbed veggies through the grater. Alternatively, veggies can be grated by hand. In a large mixing bowl, combine diced shallots, maple syrup, salt & pepper , garbanzo bean flour & almond milk- stir until well mixed. Add grated veggies and fold into the batter ensuring everything is well mixed together. Place a baking sheet in the pre heated oven. Heat oil in a rimmed saute pan - a generous 1/2 cup at a time, with your hands form veggie mixture into patties. Place patties in heated oil (careful not to overcrowd) and pan fry each side until golden brown. Transfer fritters to the baking sheet in the oven. Once all fritters have been pan fried and placed onto the baking sheet bake for 15- 20 min - if needed flip halfway through cooking to prevent one side from becoming overly crisp. 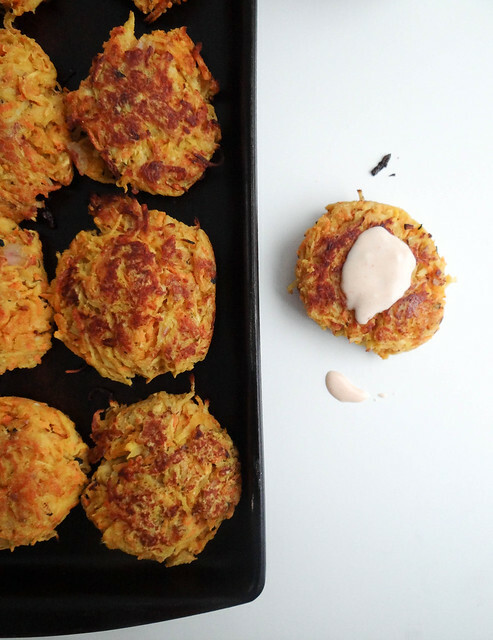 I used a stone baking sheet and did not need to flip- you can also place a raised wire rack onto your baking sheet and bake the fritters on the rack which will allow the heat to evenly move around the entire fritter. Remove fritters from oven and serve immediately. Can be stored in the fridge for up to 4 days and reheated in the toaster oven, oven or microwave. 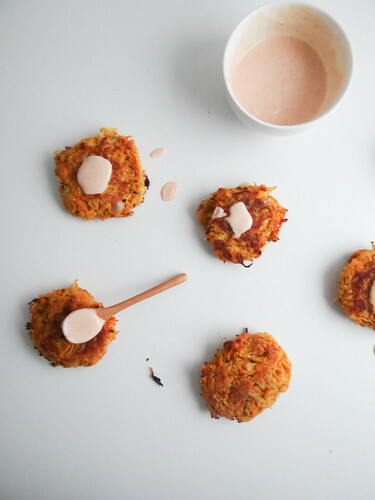 While the fritters are baking, make the aioli simply by combining all ingredients in a bowl and mixing well- adjust the siracha adding more or less to your liking. Cozy dinners, ice skating & root veggies?! Yes please! Although today is like...killer cold. But I'm enjoying the root vegetables as well. I love your aioli recipe for this! Definitely trying it! I love sweet and spicy and the aioli provides the perfect balance to the sweet fritters- definitely a favorite around here! 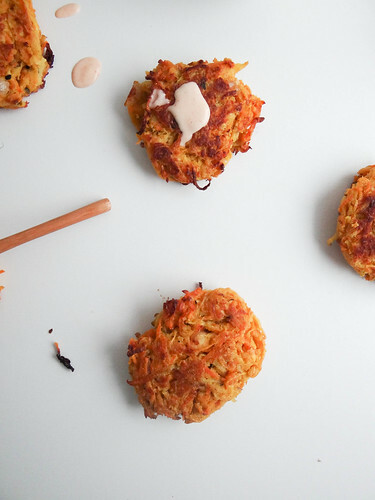 These fritters sound so, so good. 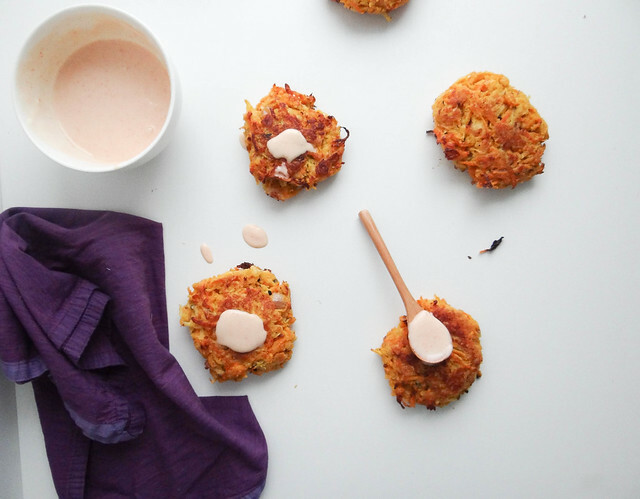 I've been dreaming about doing corn fritters this summer, but I bet these would hit the spot and take away those warm-weather cravings! One of these days I will have to take pics of the Market to share with you all, it is pretty awesome! We had another Market that was similar to the one near you but that only lasted a year or so....soaps, canned goods, yarn and that sort of thing. These are getting made SOON! They look wonderful! They were so good and the Chickpea flour made them super hearty! these are gorgeous, lady. and i'm sure DELICIOUS! Thanks pretty lady! They were really good, it is nice to switch things up during the week - they come together pretty quickly which is a bonus! Nice! I love roasted radish, the guy that grows them said they are also pretty amazing raw- I bet cutting them up as matchsticks and tossing with a green apple would be pretty amazing! The chickpea flour worked even better than I anticipated, it was the perfect egg substitute! 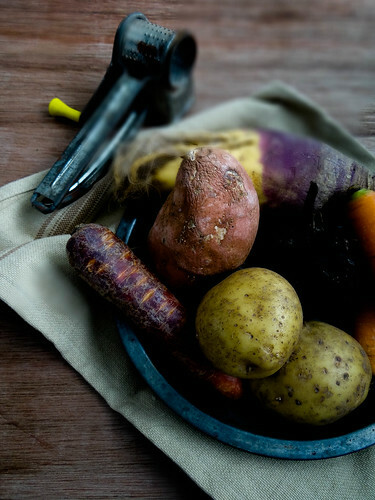 By this time of the year I am really grateful for ideas on what to do with root veggies. I have made fritters out of them before, but seem to have forgotten about them because I have not made any for a long time. I'll have to give this a try, the chickpea flour batter sounds really interesting and like a good way to bind everything together. For the aioli, do you add garlic? It does usually contain garlic or do I mix things up here? This sounds delicious either way, so it doesn't really matter. Hi Lena! I didn't use garlic but you definitely could, it would make a great addition!